It was an amazing stay and everything was spotless! The rooms and beds were very clean and they change the sheets every night even if you stay for multiple nights! It is very close to the train station and very well communicated! I highly recommend the hostel! The location just about an 8min walk from the main bus terminal is very convenient. Also close to supermarkets and Theresienwiese. Staff was very friendly, the dorm and bathroom was clean and the beds were very comfortable. Overall, great location and good value for money. Would definitely book again. Thank you. The staff were very friendly. Unfortunately there were many school groups with teenagers staying here. They were very loud and disrespectful and would run in the halls at all hours. All of the common areas were taken over by the teenagers. They staff tried to handle the situation but were over run by teenagers. There are NO lockers in the room just cubbies. The kitchen has a very funny smell and often dirty. The staff was the best part. Also very close to the train. This is a pretty long way outside of the city centre, but the trams will get you there. 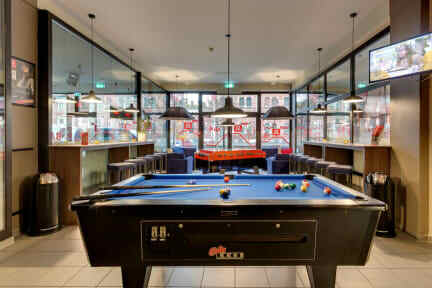 There wasnt anything wrong with the hostel, but it didnt exceed my expectations. The staff was great, and the place was clean. The location was okay, not too central and just out of town but walking distance to the city centre/train station. My only problem was that when I arrived my assigned bed was still dirty and not made. The staff tried their best, but it took a long time to try and get my bed done for the evening. Location was good if you wanted to get around by train but other than that I did not enjoy the hostel. They don’t have the bar open on the shoulder months of travel which was unlucky. The kitchen was small and for the most part filthy every time I went in. Also it has a weird smell to it. I would not stay here again. The bathroom was the only good thing about my stay, I liked how clean and modern it was. However the staff at the front desk had such poor service skills, they let a bunch of kids jump the line in front of me when I’d already been waiting 15 minutes to check in. The location was ok but not the best. There was no atmosphere. The best part was the pub across the road. There’s also a lot of construction work going on so it’s loud and the blinds don’t block light.